For Use in Homes and Other Residential Dwellings, Hospitals, Nursing Homes, Clinics, Medical Facilities, Businesses, Hotels, Motels, Restaurants, Schools, Institutions and Commercial Establishments. 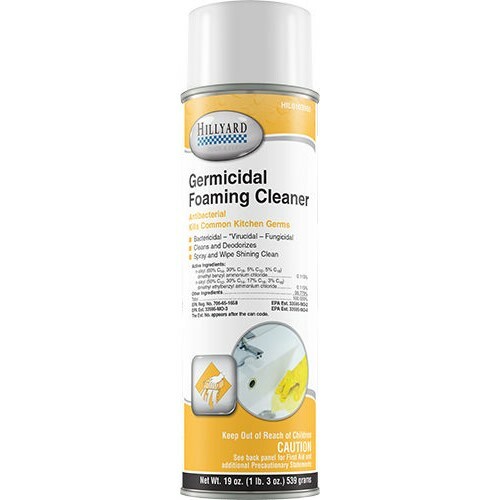 Acts as a disinfectant on hard, non-porous environmental surfaces such as toilet seats, fixtures, glazed tile, wash bowls, shower stalls, walls, finished woodwork, counter tops, kitchen counter tops, tables and outside surfaces of appliances. The easy way to clean, disinfect and deodorize. Spray and wipe clean. Cleans and disinfects without scouring or scratching. Use in nursery and sickroom, for garbage and diaper pails, for any washable hard, non-porous environmental surface that needs disinfecting as you clean. An effective, ready to use fungicide and mildewstat that cleans, disinfects, and deodorizes in one simple operation. Applied as a stable foam, its excellent clinging properties help lift surface soil for fast, easy cleaning.